In Sindbad we offer three different options for fishing; Deep Sea, Trawling or Local Fishing, with a choice of different boats. We will provide all the equipment and bait needed and send you with an experienced captain, who will increase your chances of a good. In Sindbad we offer three different options for fishing; Deep Sea, Trawling or Local Fishing, with a choice of different boats. We will provide all the equipment and bait needed and send you with an experienced captain, who will increase your chances of a good catch. With 2 hour, Half Day, 6 hour and Full Day excursions, it is also possible to pre-book lunch on board. 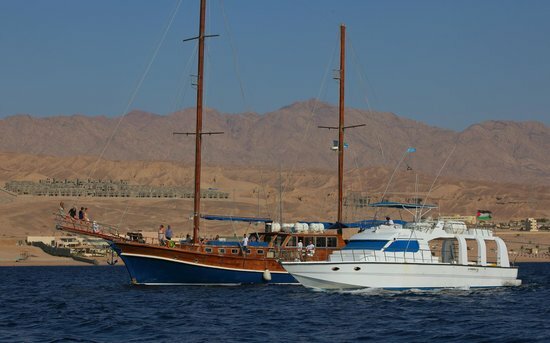 Deep SeaFrom the south beach of Aqaba, and 500 meters from coastline, according to Marine Park rules, you will drop your lines over 200 meters, with good fortune you will be catching groupers, sailfish or marlin. Start with a minimum of 4 hours, or fish until sunset. TrawlingMove along the coastline, with lines over the back of the boat; outriggers, with lures. It takes about 40 - 60 minutes to ride each way. If there is a mild wind, it’s also possible to drift, dropping lines with live bait (if available). Alternatively we can arrange to go to International waters; this will require your passport 24 hours in advance. Summer is best season for tuna, swordfish & marlin. Al Azem - Bertram 31, 34 ft. professional sport fishing yachtSindbad 69 - 65 ft. cruising yacht with fishing gearSindbad 7 - 30 ft. boat with an open deck, with shadeSindbad 8 - 29 ft. boat with an open deck, no shade.